Aaah...this sweater...what a story! I created this sweater for a wonderful lady who wanted this sweater re-created from an original photograph. I was given a pattern to work with, however the pattern looked nothing like the original photo of Schiaparelli's sweater that I was given. I ended up going row by row from the photograph to re-create the original sweater. It took about a month and a half to knit this beautiful sweater by hand. 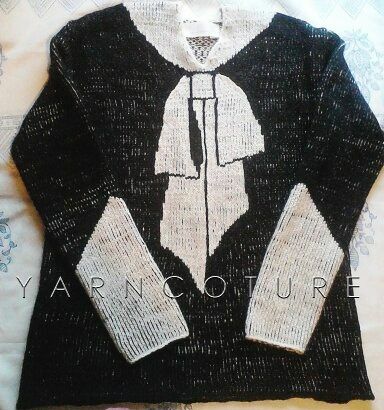 The sweater was made from a cashmere merino wool nylon blend yarn..which when knit into a garment feels very luxurious. The customer was very pleased to receive it and I was very honored to make it for her.